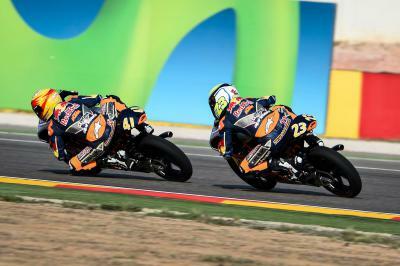 Marc Garcia rode a superb 8 laps of Motorland Aragon to win the shortened penultimate Red Bull MotoGP Rookies Cup race of 2015. 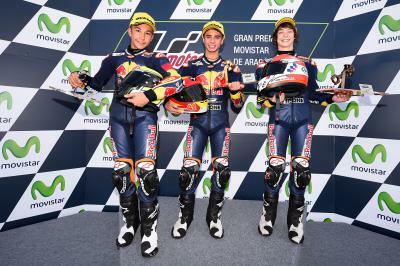 Marc Garcia rode a superb 8 laps, the 15-year-old ran wheel to wheel with fellow Spaniard, 14-year-old Raúl Fernández, as they caught pole man Rory Skinner starting the final lap. A four bike accident on lap two had stopped the initial race as 14-year-old Spaniard Aleix Viu and Cup winner Bo Bendsneyder were taken to the medical centre for checks leaving Bruno Ieraci and Enzo Boulom to walk back to the pits and unable to restart the race due to machine damage. Skinner had also led the first start but was pressured hard on lap one by Garcia who qualified fifth and Olly Simpson who had been fourth fastest. Simpson, the 17-year-old Australian, had his run of bad luck continue as at the restart he stalled on the grid, missed the warm up lap and started from the pit lane. He would finally pick up a single point for 15th. From the restart Skinner was cooler than he had been the first time and held off an attack from Garcia, who in turn had to fight off a pack of six headed by Fernández. That group included Fabio Di Giannantonio who was determined to avenge his fall in Misano and loss of the Cup to Bendsneyder. 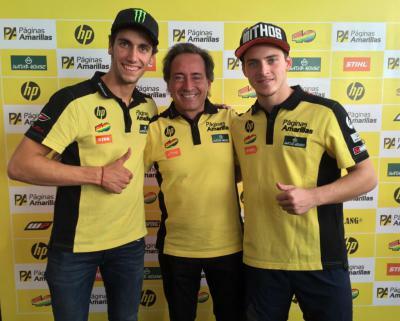 The 16-year-old Italian had only qualified ninth but he charged through aggressively. He cut his way through to second on lap 6 but the move took him off the track. As he regained the circuit he upset the group, handing Skinner an advantage. It was a one second lead for the Scot starting the penultimate lap but the Spaniards had cut that to nothing by the end of it and swept past. Still Skinner hung on but he could not get back ahead. “It's been a wonderful couple of days,” grinned Skinner. “It was just a fantastic race and I enjoyed every moment of it. I just couldn't hold them off at the end. The bike has been great all weekend, we softened up the suspension and it gave me the confidence in Free Practice 2 to really go for it in qualifying and the race. I just have to go two places better tomorrow,” concluded the teen who turns 14 on Sunday. He might still be troubled by Bendsneyder who was pronounced fit after a visit to the medical centre and should be able to race. Viu was taken to hospital for further precautionary tests but it seems he also escaped serious injury. It was a fitting end to the season, a battle for the lead that built to an eight man festival of skill and daring. 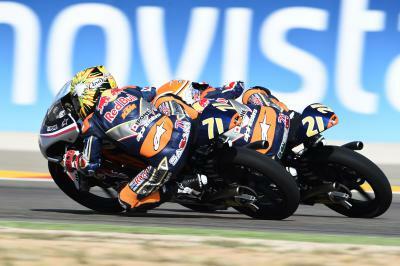 The Scot, who only turns 14 on Sunday, has Rookies Cup champ Bo Bendsneyder alongside him on the front row. 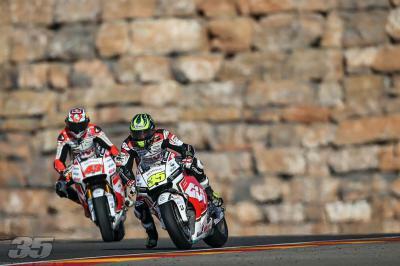 Sam Lowes says he is raring to go and will start the Aragon GP from fourth despite a crash during Moto2™ Qualifying. This is my weekly Jack attack Miller T-bone steak moment ! 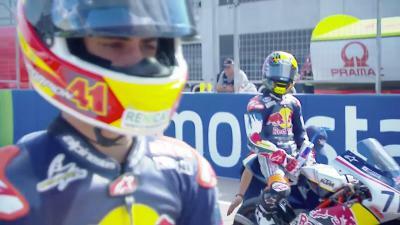 Highlights of Race 1 of the Red Bull Rookies Cup at MotorLand Aragon. 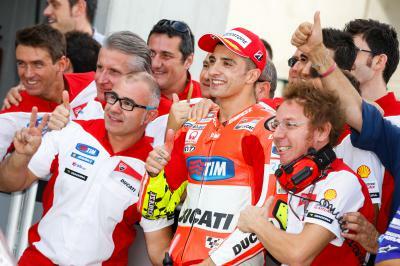 A return to the front row for Andrea Iannone, overcoming an injured shoulder at the Gran Premio Movistar de Aragon. 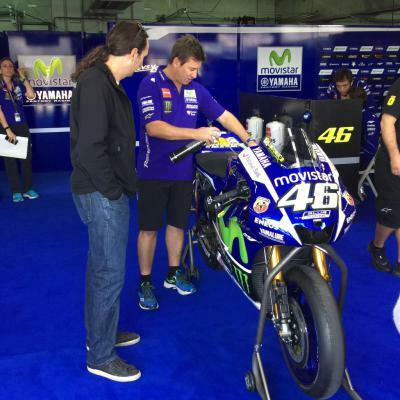 A crash in FP3 at the Gran Premio Movistar de Aragon has Bradley Smith and his team puzzled in regards the cause. A strong start to the weekend leaves Scott Redding disappointed, unable to advance out of Q1 at the Gran Premio Movistar de Aragon. 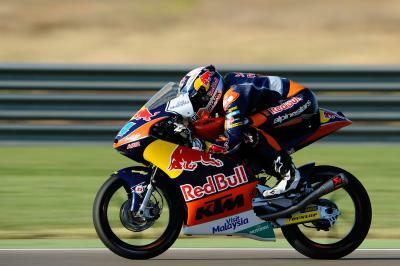 A clear race plan is in place for Miguel Oliveira, who will start the Gran Premio Movistar de Aragon in second. Back-to-back poles for Enea Bastianini as he hunts for back-to-back wins in the Moto3™ World Championship.